Francisco Costa, Thom Browne and Tom Binns are the top fashion designers of the year, taking home the big prizes at Monday night's Council of Fashion Designers of America awards. Costa was named womenswear designer of the year three years after taking over creative duties at Calvin Klein from the company's namesake designer. Klein won the award in 1987 and 1993. "If there's an American dream, this is it for me," said Costa, who grew up in Brazil's countryside. He beat out perennial nominee Marc Jacobs, who won the womenswear award in 1997, and Lazaro Hernandez and Jack McCollough of Proenza Schouler, who had been picked as the best up-and-coming designers only three years ago. Meanwhile, Browne was selected over Cloak's Alexandre Plokhov and Ralph Lauren for menswear designer. Browne told the crowd — which included Janet Jackson, Jessica Simpson, Chloe Sevigny, Sandra Oh and Sean "Diddy" Combs in addition to top fashion designers Vera Wang, Diane von Furstenberg and Donna Karan — that Lauren was an inspiration to him and to so many others in the room. 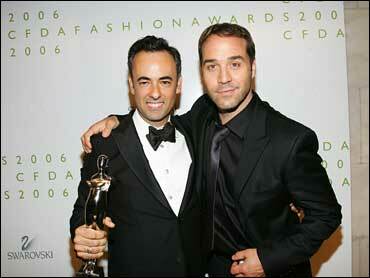 The CFDA awards are the fashion industry equivalent of the Oscars. Jeremy Piven, star of HBO's "Entourage," was the host of the 24th annual ceremony. He joked that his only qualification for being on stage is that he was "one haircut away from the Tom Ford story." The fusion of fashion and Hollywood continued with Lindsay Lohan and Karl Lagerfeld presenting Binns with the award for accessory design. The jewelry designer was selected over Jacobs and Michael Kors by the CFDA membership, press, retailers and stylists who vote on the awards. The rest of the awards went to a mix of industry icons, including photographer Bruce Weber, former Neiman Marcus senior vice president and fashion director Joan Kaner and CFDA President Stan Herman — who was serenaded by a sultry Bernadette Peters, and the next generation of fashion stars. Doo-ri Chung won the award for emerging talent in womenswear, Devi Kroell for accessories and Jeff Halmos, Josia Lamberto-Egan, Sam Shipley and John Whitledge of Trovata for menswear. "Wow, this started as a way for us to surf and travel as much as possible while making a living," the Trovata team said as they accepted their award from Alicia Keys and John Legend, who had just sang an a cappella version of Frank Sinatra's "The Way You Look Tonight." Oh, from ABC's "Grey's Anatomy, was a first-timer at the event held at The New York Public Library. She was in a strapless white cocktail dress with black trim and on the arm of designer Peter Som. How does one become a fashion designer's date? "He made the first move," she said with a laugh. "And it was a Monday, so I was free. If it were a Saturday, I couldn't do it, I'm in a play." She also said she was a little overwhelmed by all the glamour. Sevigny, who came with the Proenza Schouler designers, wore a black and white scribble-print minidress from the upcoming fall collection. She chose it online, she said, and she did her own makeup and hair, which was pulled back in a simple bun. Kerry Washington arrived with Kors. Both she and the "Project Runway" judge had the same dress in mind for her to wear, a coral-colored short cocktail dress. "I'm lucky. I get a great dress and a great date," Washington said.